Port Metro Vancouver has approved a new coal export terminal ending a tough run for about seven such proposals on the Pacific Northwest. Several have failed, at least two remain in Washington State, but the first to get the green light is Fraser Surrey Docks in the Port of Vancouver known as Port Metro Vancouver. The 4mtpa (million tonnes per annum), $15 million proposal at Fraser Surrey Docks on British Columbia’s Fraser River, will bring coal in by rail from the Powder River Basin in the United States, load it on barges, and tow the coal to Texada Island in the Strait of Georgia where it will be stockpiled for loading onto Panamax sized vessels, largely bound for Asian ports. Texada Quarrying, a Lafarge company, recently received provincial approval to stockpile up to 800,000 tonnes of coal at its existing terminal such as that likely from Fraser Surrey Docks. It has been shipping coal for the past 20 years for Quinsam Coal of Campbell River on Vancouver Island, as well as its own limestone and aggregates. Once it is up and running by the fall of 2015, Fraser Surrey Docks could apply to increase its coal throughput to 8mtpa, but that will take another Port Metro Vancouver project and environmental review. The permitting process was a grind lasting 26 months and clouded in controversy as environmental groups and health officials worried about the safety of moving coal, seemingly disregarding that coal has been shipped through the port for over 44 years without any serious incident or health ills. 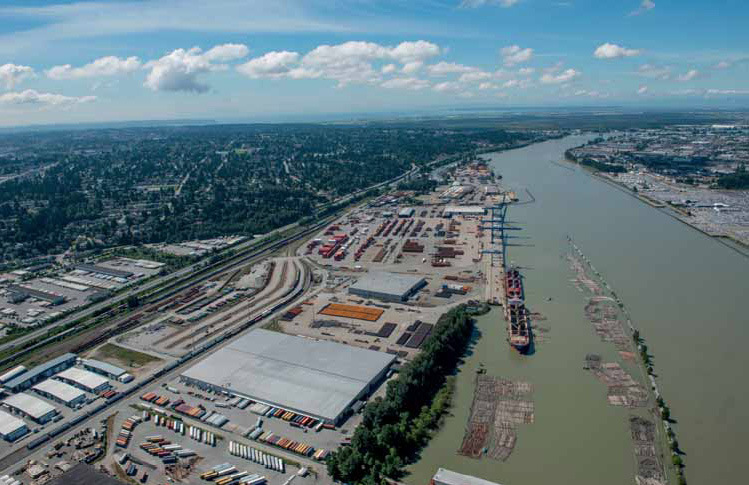 As a multi-purpose terminal established in 1962, Fraser Surrey Docks wanted to simply add coal as a product to help compensate for slumping container shipments over recent years — all without adding to its shore footprint on the river. “It was a long and arduous process, but we’re genuinely pleased to win approval,” says Jeff Scott, Fraser Surrey Docks President & CEO. “We worked hard to prove the analysis, we listened carefully to stakeholders, and we changed and enhanced the project after listening to their concerns. “Now we can get on with designing and constructing the facility,” adds Scott who lives in the area with his “young kids” and wanted to reassure “my family and friends that it was safe” to move coal through the area. Scott and his team dropped plans mid permitting process to have a coal stockpile on the facility’s 63-hectare site and instead will bottom dump the incoming coal rail cars into a gravity-fed receiving pit and carry the coal onto waiting barges via conveyor and a shiploader, mixing a binding agent into the coal during loading to satisfy environmental critics. Coal hauler, Burlington Northern Santa Fe has agreed to build a second re-spray facility to apply a dust suppressant half way on the journey to Fraser Surrey Docks. Port Metro Vancouver has imposed 81 conditions on Fraser Surrey Docks in granting permit approval, but Scott says “all are manageable and not unexpected,” and most would have been dealt with in the normal course of the project such as spill prevention, dust suppression, and air quality management issues. “Overall, we are very pleased and are committed to ensuring the project is safe and of no significant risk to the public,” adds Scott. Port Metro Vancouver, which runs Canada’s busiest port with total throughput of 135mt (million tonnes) in 2013, ships more coal than any other port in North America. Led by Westshore Terminals (shipments of 30.1mt last year), Neptune Bulk Terminals (about 8mtpa), and occasional trial shipments through Pacific Coast Terminals, the port totalled over 38mt in 2013 and is ahead of that pace this year despite global coal markets being soft. In British Columbia, environmentalists remain concerned that Port Metro didn’t take into account the global warming effects of burning the export coal overseas, something the port insists is well outside its mandate and likely a stipulation that no other coal export port application in the world has had to factor in to the permitting process. The Fraser Surrey Docks approval came just three days after the State of Oregon denied Ambre Energy’s request for a construction permit to build a coal export terminal at Boardman on the Columbia River, saying the project was not in the best interest of the state’s water resources. Australia-based Ambre was the front runner up until then amid a host of coal export terminal projects, several of which have fizzled because of huge environmental concerns, or more simply because of the depressed world coal prices. “The project definitely is not dead,” says Liz Fuller, a spokeswoman for Ambre Energy, which is evaluating its options including an appeal for what it termed “an environmentally friendly proposal to barge coal down the Columbia River” to the Port of St. Helens. Previously, the company had won three permits from the Oregon Department of Environmental Quality for air, wastewater and storm water and had a draft permit for 401 water quality certification, with a final permit on that still pending. The world’s most abundant coal country, the US currently has no export outlet on the West Coast and is largely shipping through Westshore Terminals in Port Metro Vancouver. At one stage about three years ago there were six or more coal export terminal projects on the books with a combined capacity of well over 100mtpa, but these have been thinned to about three, including the stalemated Columbia River project of Ambre Energy. Ambre and SSA Marine have a much bigger coal project known as the Gateway Pacific Terminal near Bellingham half an hour south of the Canadian border, which is planned to have a throughput capacity of 48mtpa, making it the largest on the coast. Westshore Terminals is currently amid a $275 million four-year equipment replacement and site upgrade project that will take its throughput capacity to 36mtpa. However, the Gateway project is mired in the environmental and permitting process and at last report was a couple of years away at least while some experts says it is five years away . . . if it wins approval at all. At least two other US projects are still deeply mired in the environmental and permitting process — in one Kinder Morgan dropped a proposal to rail Power River Basin coal to Port Westward in Oregon after protracted public opposition to the project. That makes the Fraser Surrey Docks barge proposal the first to actually emerge out the winning end of what is proving to be a highly involved and emotionally charged process.